"A friend of mine gave me this recipe years ago. Sometimes I lower the fat content by using fat-free sour cream or yogurt instead of the sour cream. Enjoy! This can also be made into small loaf cakes which can be frozen easily." Preheat oven to 400 degrees F (205 degrees C). Grease a 10-inch bundt pan. Beat butter and sugar with an electric mixer in a large bowl until light and fluffy. The mixture should be noticeably lighter in color. Add eggs one at a time, allowing each egg to blend into the butter mixture before adding the next. Mix in vanilla. Combine flour, baking soda, and baking powder. Pour flour mixture into batter alternately with the sour cream, mixing until just incorporated. Fold in walnuts, mixing just enough to evenly combine. Pour half the batter into the prepared pan. Mix the remaining 1/4 cup of white sugar with the cinnamon. Sprinkle cinnamon sugar over the batter in the pan. Drop remaining cake batter in heaping spoonfuls over filling, covering it as best you can. Bake in preheated oven for 8 minutes. Lower heat to 350 degrees F (175 degrees C) and bake for an additional 40 minutes, or until a tester comes out clean. 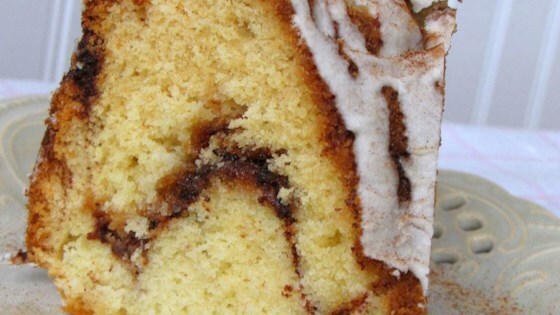 A layer of cinnamon hides in the middle of this gorgeous bundt cake. This recipie was very good. I would suggest using an icing to drizzle over the top. The icing i used was: 1c. powdered sugar, 2tablespoons milk, and 1teaspon of vanilla extract.